About 67 million adults in this country have discovered that walking is one of the most fun, natural, and inexpensive ways of keeping your health—and your feet—in top shape. Walking can be enjoyed almost anywhere, any time, and year around. It’s also a good way to get exercise, particularly for people who are out-of-shape. According to the American Podiatric Medical Association, exercise offers a host of benefits. Walking helps control weight, blood sugar, and cholesterol levels. A brisk walk can burn up to 100 calories per mile or 300 calories per hour. Walking also improves cardiovascular fitness. As an aerobic exercise, walking gets the heart beating faster to transport oxygen-rich blood from the lungs to the muscles. The heart and lungs grow more efficient with a regular walking regimen, reducing blood pressure and the resting heart rate. Walking is also a central element of medical rehabilitation for a wide array of health problems. For example, recovery from a heart attack can be facilitated by a regular walking regimen. Additionally, walking creates an overall feeling of well-being, and can relieve depression, anxiety, and stress by producing endorphins, the body’s natural tranquilizer. A brisk walk will relax you and also stimulate your thinking. 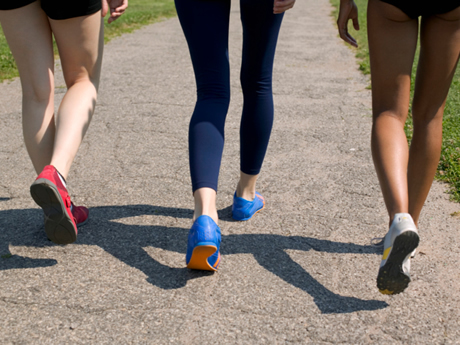 To gain the most health benefit from walking, it is important to pay attention to your feet. Shoes that don’t fit properly or provide adequate support, lack of stretching, and improper gait can lead to foot injuries or pain. The most common foot problems are blisters, corns, calluses, and plantar fasciitis. When you walk, the natural motion of your foot rolls gradually from the heel to the toe, with your foot bending at the ball on each step. That’s why it is important for walking shoes to have enough flexibility in just the right places. A good walking shoe should give a little when you twist it and bend at the ball of the foot. When you put the shoe on a flat surface and push on the toe the heel should come up off the surface. If it does, the shoe has the curvature you need to conform to your movement during walking. Make sure the heel is low and not too wide. A slight undercut in the heel will help your foot begin its roll from the heel through the step.